Sony 4K VPL-VW500ES and VPL-HW55ES boost projector range | What Hi-Fi? Sony has launched two new home cinema projectors at IFA 2013 in Berlin, the 4K Ultra HD VPL-VW500ES and the full HD 3D, VPL-HW55ES. The Sony VPL-VW500ES brings the 4K big-screen home cinema experience to a slightly more affordable price, coming with a price tag of £8,500. The VW500ES sits below the flagship Sony VPL-VW1000ES, which we reviewed back in May 2012 for an eye-watering £16,790. Using 4K SXRD panels, Sony's favoured projection technology, the new model sports a 4096 x 2160 resolution and also has the brand new HDMI 2.0 standard, which supports 4K content over HDMI, amongst other new features. 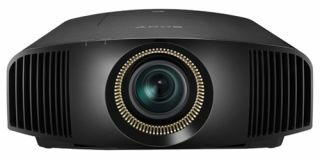 Other proprietary Sony picture technologies are on board, from Triluminos display to Motionflow processing, while the 4K projector claims a 1,700 ANSI lumens brightness and 200,000:1 contrast ratio, for all you number-crunchers. Reality Creation promises to get the best out of HD and 3D content – yep, it's a 3D projector, too – while Sony claims there's also an upscaling alogorithm to get the most out of its Mastered in 4K Blu-ray discs. If you're not ready to leap aboard the 4K TV bandwagon quite yet then the Sony VPL-HW55ES could be for you. A full HD 3D projector, priced at £2,750. The HW55ES claims a 1,700 ANSI lumens brightness figure, 120,000 dynamic contrast and a 5,000 hour lamp life. Sony Bright Cinema, Bright TV and Reality Creation are also packed inside to get the best out of any room or content. Tak Nakane, product manager at Sony Europe said: "The VPL-VW500ES brings the cinema experience into the home like never before and reinforces Sony’s commitment to lead in 4K innovation from lens to living room. "Innovations such as Sony’s 4K SXRD panels provide unrivalled picture quality at high resolution to make the 4K dream a more affordable reality. The addition of the VPL-HW55ES provides a premium 3D home cinema experience and expands the product range from which our customers can choose." Both Sony projectors are due out in October, with the VW500ES on sale for £8,500 and the HW55ES priced at £2,750.